The Pecos League has agreed to a two year extension with the City of Alamogordo. 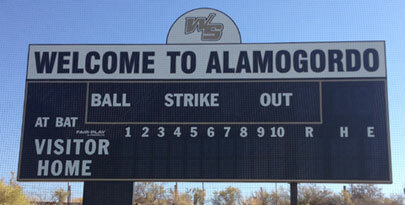 7/6/2012- The Pecos League has agreed to a two year extension with the City of Alamogordo. The Pupfish will play in Griggs Park 2013-2014 seasons. "We are committed to stay in Alamogordo indefinitely. It is the best city in our league by far." says Pecos League Commisioner Andrew Dunn. The City of Alamogordo has jumped at the opportunity to have pro baseball in their town. Since day one they have been improving Griggs Park with limited and creative resources. The Pecos League has hosted both All-Star Games in Alamogordo and also hosts league tryout camps there. The Pupfish will soon have a minor redesign on their logo/uniforms. The team is currently tied for last place and has never got things in gear this year, but the off the field commitment from the City of Alamogordo is second to none. The Pecos League will be announcing other cities for the 2013 season over the next three months. The Pecos League is expected to stay in the exact six cities that are playing in 2012 with possibility of adding teams for 2012 season.